In this image from 2010, then-Senator Alice Varnado Harden speaks to 350 students from Mississippi's three public historically black universities. The United States has a long history of systemic inequality in its treatment of minorities, especially African Americans. Now, a new study suggests that higher education is yet another part of American society that treats black people unfairly. The study comes from the University of Southern California’s Race and Equity Center, which released its findings in September. Researchers from the center looked at information from the U.S. Department of Education’s Integrated Postsecondary Data System. This a database of information gathered from every college and university in the U.S. that accepts federal financial assistance. The researchers also looked at population data from the U.S. Census Bureau. The center’s researchers used data from the 2016-2017 school year to examine four qualities of most of the country’s public colleges and universities. They did not include community colleges or public historically black colleges and universities. One quality the study examined was the percentage of black undergraduate students. Researchers looked to see if it matched the overall college-aged black population in the school’s home state. Researchers also considered the percentages of black male and black female students attending each school. They compared those to the national percentages of male and female university students of all racial and ethnic groups. The third quality under study was a school’s rate of graduation among black students within six years of their entry, and how it compared to overall graduation rates at the school. And finally, researchers looked at the number of full-time black professors in relation to the number of black students. The University of Southern California’s researchers graded all four qualities of the schools on a scale from zero to four. A four meant the school is serving African American students in the best way possible in a given area. The researchers took the average of those “grades” and gave them an overall grade on the same scale. Then, they combined the grades of all the schools they looked at in a state, using the averages to give each of the 50 states an overall grade, as well. All 50 states received a grade of less than three. Shaun Harper says this shows just how poorly the U.S.’s public higher education system is serving African Americans. He is the executive director of the Race and Equity Center and he helped write the report. Harper notes that most colleges and universities have tried to increase diversity as well as help the success of minority students. And he admits that they have improved conditions for minorities overall. However, schools have done little to solve the specific problems individual racial and ethnic groups face, he argues. He says African Americans have traditionally faced many barriers to higher education. He says many grow up in areas where public education is severely lacking in financial resources and other supports at the high school level and below. So African Americans have to work harder to reach higher education. And once they get there, non-black professors are likely to treat them as though they will not succeed, Harper says. Mike Baumgartner is the executive director of Nebraska’s Coordinating Commission for Postsecondary Education. The report listed that state second to last in the country in terms of how well is serves African American students. Baumgartner notes that, earlier this year, the research group the Education Trust praised his state’s efforts to improve its service of black students. The group found that Nebraska had the largest gains in numbers of black students successfully earning college degrees of any state since 2000. But he also admits that the report represents an “unacceptable” failure on the part of Nebraska’s public colleges and universities. And he says the state must do what it can to solve this major problem. Baumgartner says a big part of the problem is geographic. He notes that most of the African Americans in his state live in the larger cities. Some of the public colleges serve small, local communities far from students’ homes and families. And for black professors, these communities are so small their husbands or wives may have trouble finding employment. “The rural nature of the state, and the fact that some of our colleges are pretty far away from the population centers makes it difficult for them to retain the African American students,” Baumgartner said. 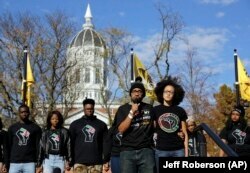 In this 2015 photo, graduate student and member of a black student group Jonathan Butler, center, speaks to a crowd during a demonstration at the University of Missouri. However, Harper says that is an unacceptable answer. He argues that African Americans pay taxes that support public colleges and universities. So the schools have a responsibility to reach out to high schools across their state and try to get black students to want to study there. Jessica Cruz says that is exactly why her position was created in 2016. She is the chief diversity officer at Northern Michigan University in Marquette, Michigan. The Race and Equity Center’s report listed her school second to last in the nation in terms of how well it serves African-American students. Cruz has already begun to take several actions suggested by Shaun Harper and the report to improve the situation. For example, her school is home to a group called the Black Student Union, which operates a program called ‘BSU on Wheels.’ It sends current African American students in Marquette to high schools in Detroit, Michigan, about 600 kilometers southeast. There, they share their college experiences with the younger students. Cruz also recently launched a program called ‘Aim North.’ Once her school admits students from the Detroit area, the program connects them with one another and helps them build a sense of community at their new school. Still, she notes, barriers remain that can prevent black students from feeling like they belong at such a rural school like Northern Michigan University. “With the community being predominantly white, we are not going to have the same kinds of services available that you would have in a place like Detroit or Grand Rapids. … Food, hair products and hair services, and religion; things like that,” said Cruz. Hilary Shelton is the head of the Washington, D.C. office of the National Association for the Advancement of Colored People (NAACP), one of the U.S.’s oldest civil rights groups. He says he fully agrees with the report’s findings on the failings of public schools. But he says there are additional problems that the report did not examine. A major barrier, he says, is cost. In 2016, the U.S. Census Bureau found that black households have had the lowest average yearly earnings out of any racial group since 1967. And about 22 percent of African Americans live below the poverty level; again, more than any other group. African Americans have long depended on financial assistance, like that from the federal Pell grant system, to help pay for higher education, says Shelton. But in recent years, the cost of college has severely increased and the value of such aid has decreased. “We have still not caught up with the spending power of the Pell grant, even from the 1960s, to make sure that students have what they need to actually pay their tuition,” he said. Pete Musto reported this story for VOA Learning English. Caty Weaver was the editor. We want to hear from you. How do you think colleges and universities might be able to best serve the specific needs of different minority groups? Write to us in the Comments Section or on our Facebook page.